Weather: Deep frost, -1°C. It had gone down to -4°C overnight. 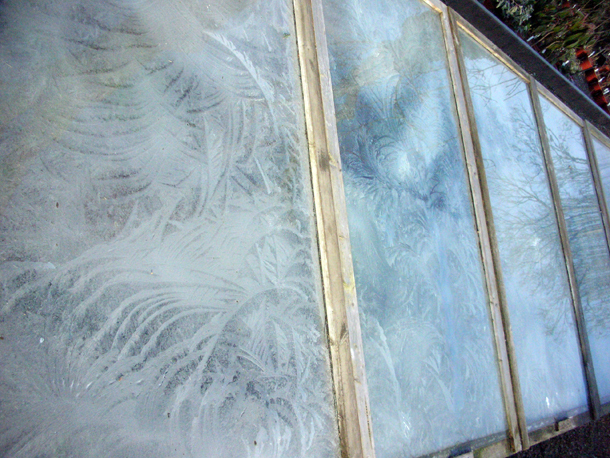 There were icicles along the inside of the windows of the hothouse, and Aeoniums in the coolhouse had gotten frosted. It was a potting day today - I potted on Gladioli sp. - one reasonable sized bulb or three small bulbs in a pot. Rachael split Bergenia 'Beethoven' (which has white flowers) and did root cuttings of them also. 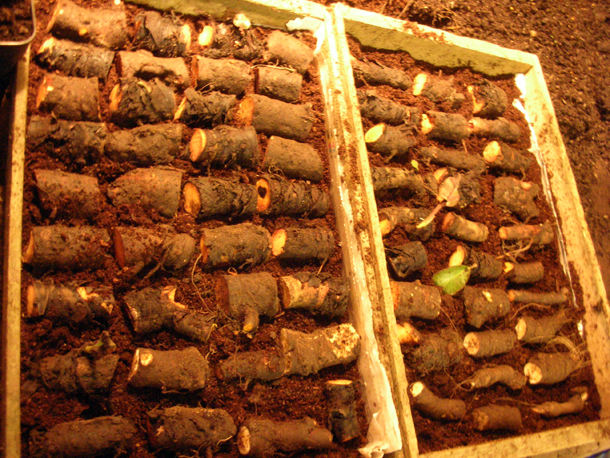 The roots were laid and covered with peat in a wooden seed tray. Then they were placed in the hot house underneath the benches. Kate did roots cuttings of Inula Hookeri putting three 1 inch pieces in a compartmented seed tray (very close to the surface and lightly covered with soil on top - using a No.1 compost mix). 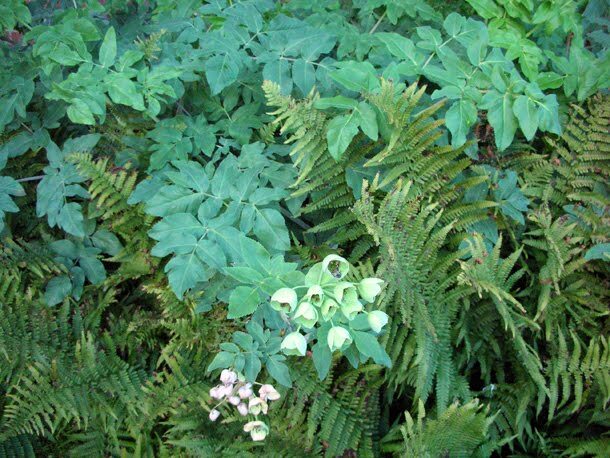 Inulas are vigorous so potentially if roots cuttings are done at the end of the year, you could get growth and flowers by July - August the following year. Weather: Cold. Around 3°C again. Unexpected snow in the morning. Then rain in the afternoon. We worked on the area which I like to personally refer to as 'the fort'. As there is a mound at the top surrounded by a small wooden fence, which is our water reservoir, and there is a steep bank on one side of it. On this side next to the driveway & near the horse pond it looks like a non-sort of space, but Fergus loves this area because he feels like it is the random kind of space a personal garden would have. As if we were about to take siege we climbed up the hill to cut back all the ferns, saving the fronds for insulating plants and picked up all the twigs, fallen branches etc for a bonfire at Pen Stump. 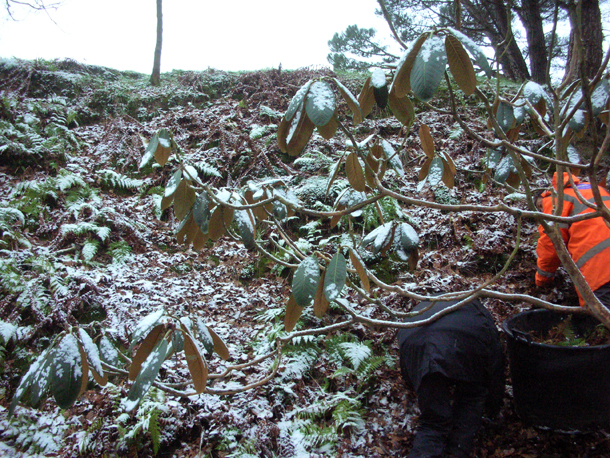 Then we cut down all the Sambucus around that area trying to be careful not to crush the drifts of snowdrops coming up. Weather: All days were cold but sunny, around 2 to 3°C. The skies were ribbons of beautiful colour and stratas of cloud & light. 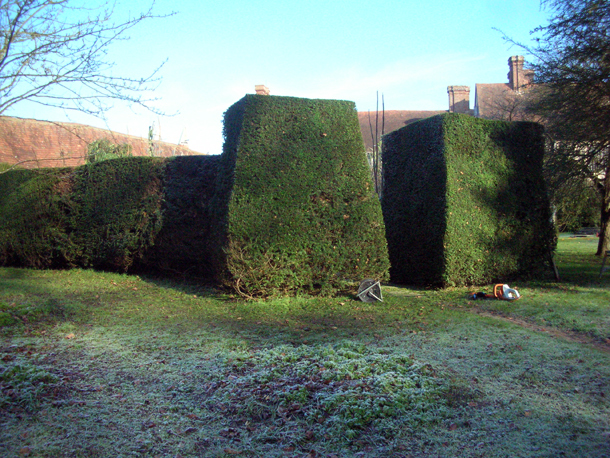 I spent a few more days doing hedge trimming, by the end of it I felt like I had really got a hand on it. I learnt that doing wide long sweeps at a time was what helped keep the cut more uniform & straight, and not to hone down too much on one section because a) it can induce obsessive compulsive disorder, and b) you're in the danger of not seeing the hedge as a whole and may create extra needless undulations or varying bits on one surface to jut out too abruptly at different widths (dependent on how the yew grows, e.g if you have a thicker/ thinner section). It also helped make doing it faster but still able to maintain precision & control. It was good to remember to keep standing back and looking at it from the side and the front, to keep a feel of the shape as a whole. 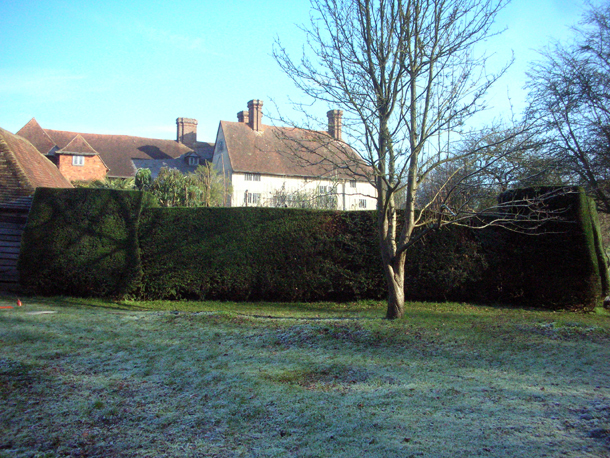 The beauty of the yew hedges as Christopher Lloyd had once commented, is that they never stay straight, and that they will always eventually sag and bulge, dismissing any airs of pretension. It as if they reflect the landscape and rolling hills around them and this is what gives Dixter it's character too. Weather: Around 9°C. Misty and wet. 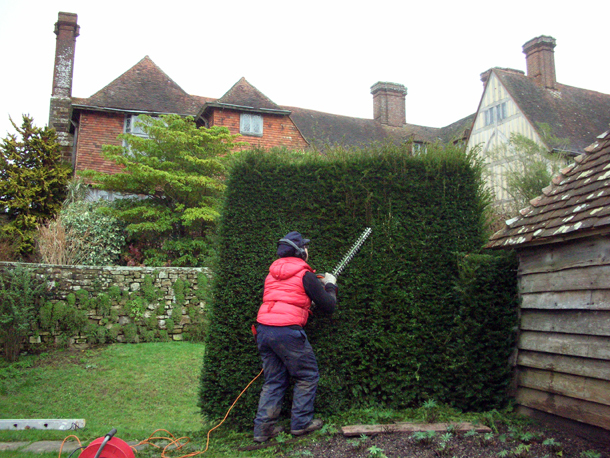 I sampled doing some hedge-cutting today - the yew backbone structures of Dixter - the action is akin to that of combing or giving the hedge a haircut. 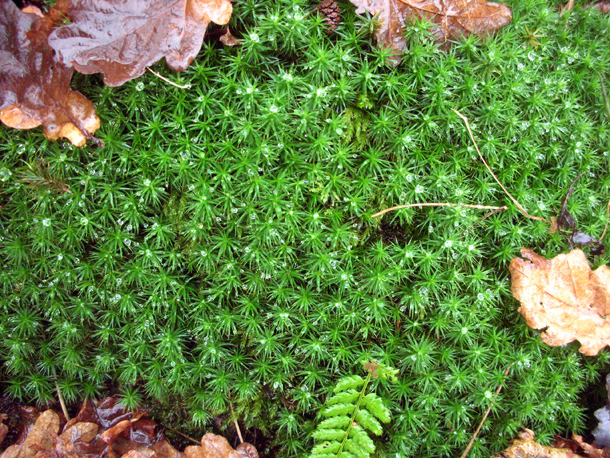 The aim is to achieve a certain tightness of the surfaces and structure, light green areas indicated new growth, offset by the darker older growth behind it. This helped give an indication of where one could cut and how much. One had to be careful that the top of the hedge didn't shadow the bottom of the hedge too much, otherwise this would result in die back at the base. Any prudent upright twigs that stood out needed to be thinned, or they would turn into bulges. I make an initial rough cut to get a better jist of the shape and then I set about refining the cut. The key is to keep the trimmer as straight as possible especially the tip, so that it does not go into the hedge too much. After, I would rake it over to brush off any loose bits and helping to raise any bits that I might have missed. 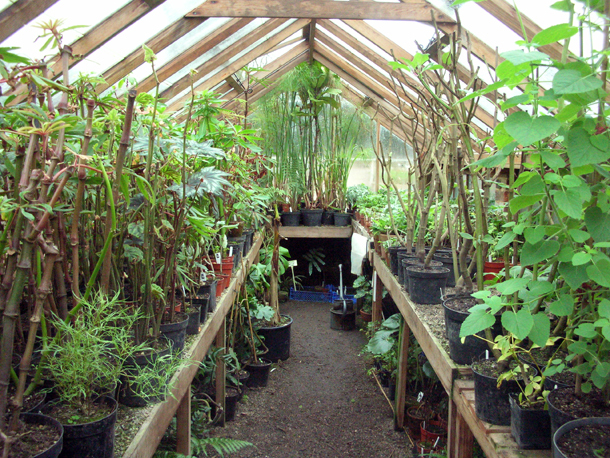 The hothouse looked well - some of Impatiens tinctoria cuttings losing their leaves but still good growth. Plants at the back of heat bench wetter than the front. Getting to know the idiosyncrasies. More confident in watering the cutting with more foliage as I have observed that they can handle it and seemed to want to the watering. Tentative still with other things like Begonia luxurians and Helichrysum. Weather a bit changeable so opened windows accordingly. 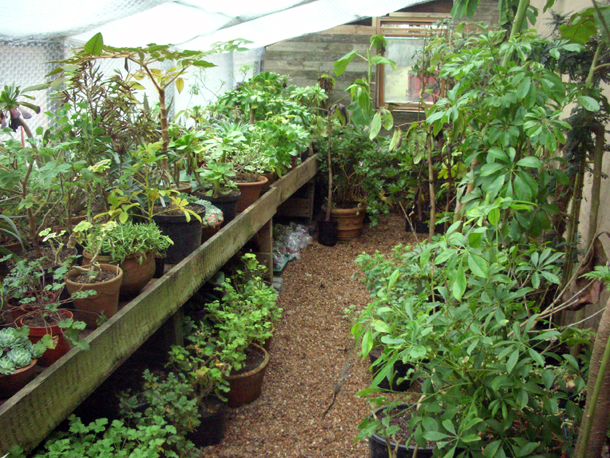 Cool house - I have made looking after the greenhouses part of my project now. Starting to go through the plants one by one, clearing them and looking for anymore vine weevil that I had detected earlier. Helped open and check general garden stock frames. 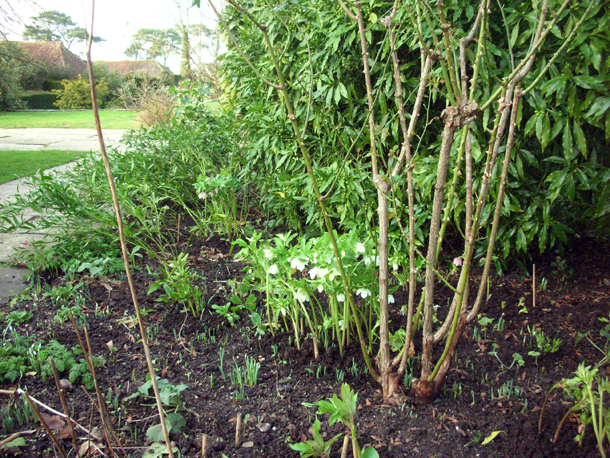 Finished cutting back Hellebore orientalis foliage and mulching them. Cut back dead phlox stalks in the Long Border right to the ground, marking them with canes so that we know where they are. 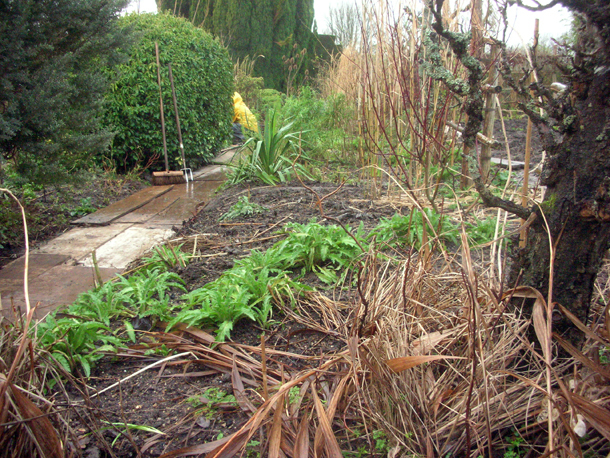 Helped to finish clearing brushed up debris from the now skeletal Exotic Garden. Potted up various things including some lupins that were dug up from the vegetable garden to make space. Assisted in closing stock frames, but keeping them chocked because of the warmer weather. Spent a while in the hothouse - the plants were well watered for over the weekend and it seemed to have brought on some cuttings faster, but I observed carefully how the rest of the plants had taken to this. Seems like it is good for cuttings with more foliage but may be still a bit too much for Helichrysum (especially ones that were a bit more crowded and low lying to the pot anyway). Spot watered rest of plants sparingly but a bit more boldly as we were able to really ventilate it well today because there was more light and sunshine. 10. Verbascum 'Christo's Yellow Lightning' (also perennial) - the one named after a donkey. 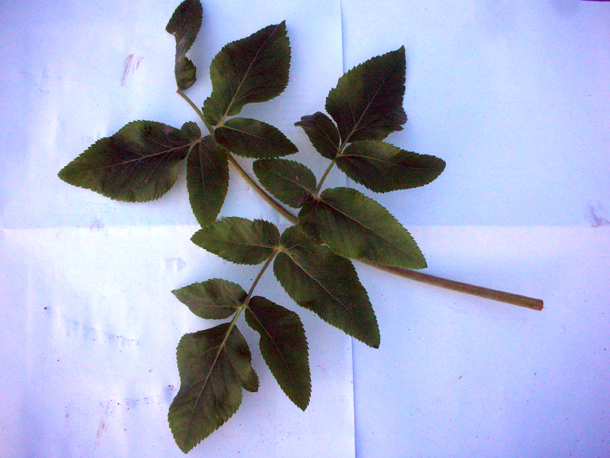 It is defined by it's crinklyish leaves (usually more than olympicum with a red line in the middle) - as described before here. 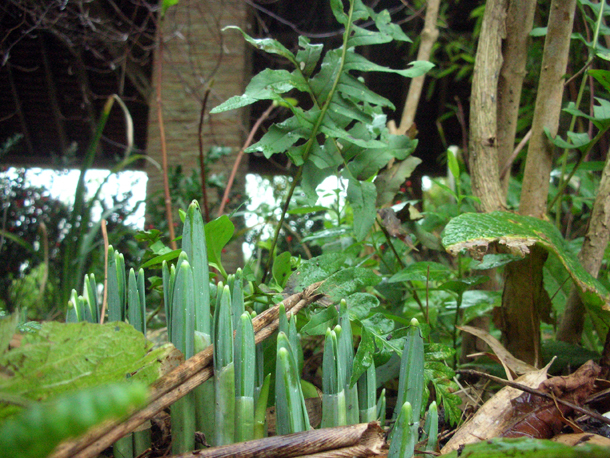 One of the first things that we did when we got back was take a walk around the garden and see what was new. Any plant that is of winter interest is precious, but the highlights are the scented ones that wafts to your nose on a cold crisp morn. 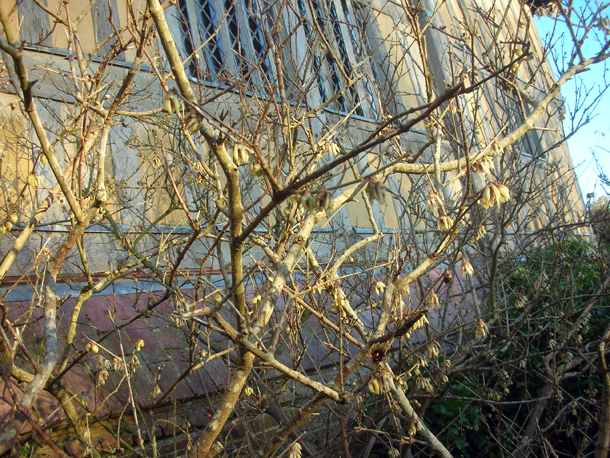 Chimonanthes praecox has almost plasticky translucent flowers, aka Wintersweet it has a honey like smell and is originally from China, and is used there to scent linen and herbal tea. 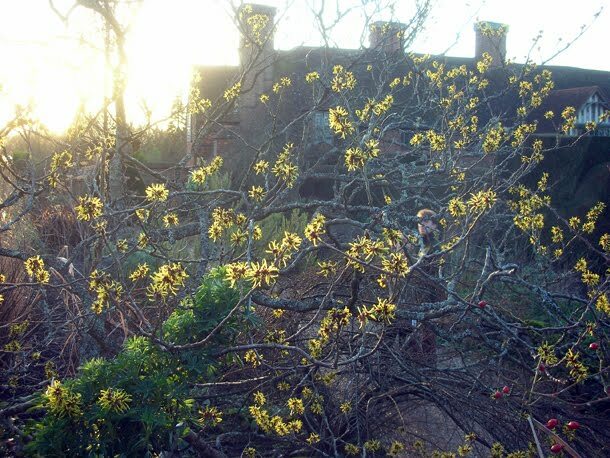 This Hamamelis doesn't have a smell but is beautiful in the sun. 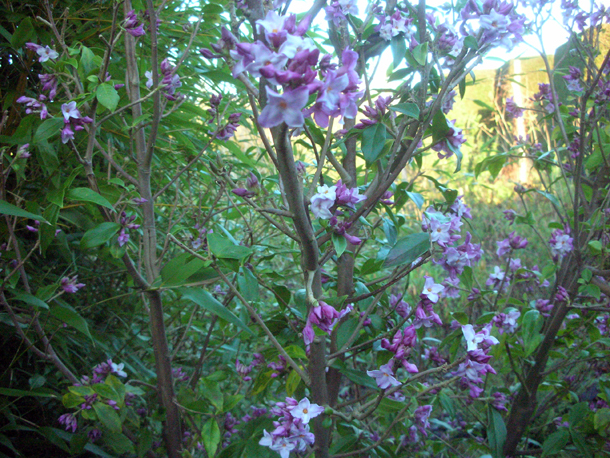 Daphne bholua 'Peter Smithers' out in full bloom. My favourite - Sarcoccocca confusa lifts the spirit everytime one walks pass it, S. hookeriana & S. ruscifolia has the same effect. 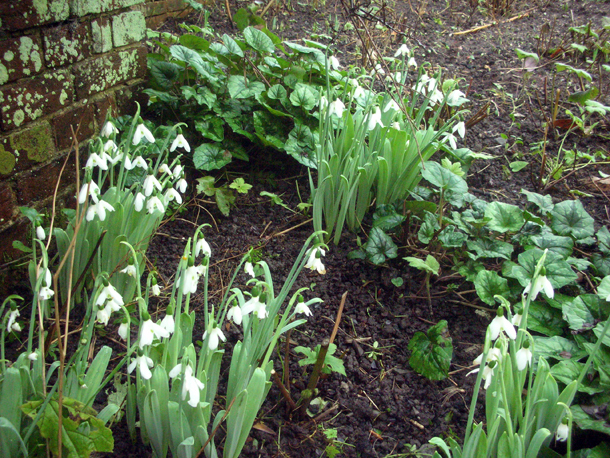 An early type of Galanthus that has already got going. Weather: 7°C - 8°C. Grey & drizzly. It made greenhouses inside feel humid. Most of the day was spent cutting back the foliage of Hellebore orientalis and herbaceous ferns all around the garden, right down to the surface or stump to help give space and light for bulbs coming through like hyacinths and snowdrops. We take advantage whilst dealing with these to feed it with bonemeal and give it a good mulch of mushroom compost. 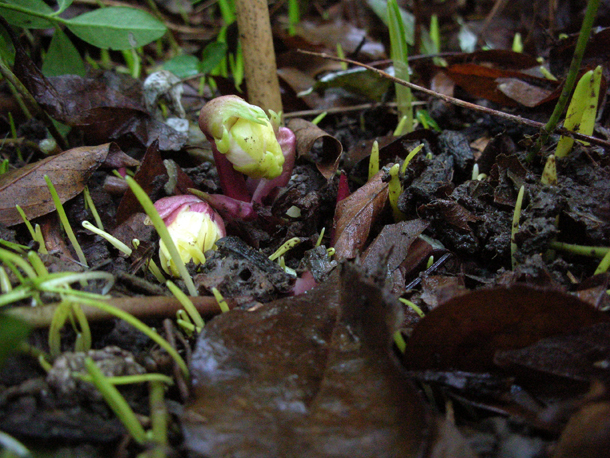 It is amazing what is poking through already even under canopies of dead leaves. Over the weekend I discovered that some of the succulents had rotted a bit, and that an Aeonium had been attacked by vine weevil larvae - they are like little maggots with a white body and a yellowish head. The larvae bored right into the stem, making what it had chomped through a fine brown crumb. They usually attack the roots and have probably gone from there upwards. We cut back what was salvageable and squishing the larvae where we could. We will be putting the damage bits and the soil into Pen Stump where it will get burnt. 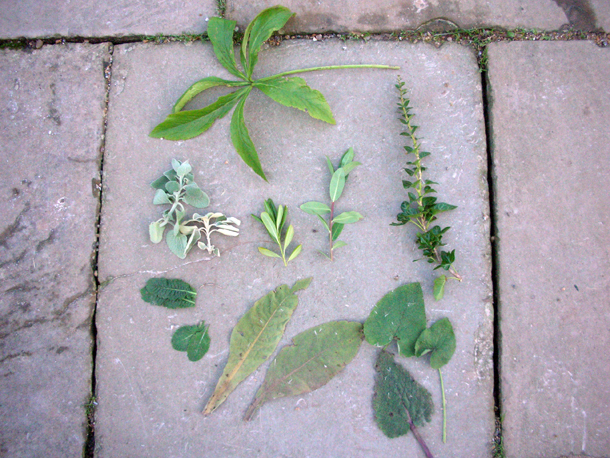 As this is the first time I have taken on this house I will be going through each plant separately and checking that they are ok, so that I can start looking after them all from how I know them. Removed some plants from the cool house that we felt didn't need as much shelter but would be protected enough under the Loggia - a Yucca, Furcraea and a palm. This helped ease up more space to be able to move things around a bit more and aid ventilation. Potted up some yew trees dug up from the veg garden (these are back ups for our yew hedging). 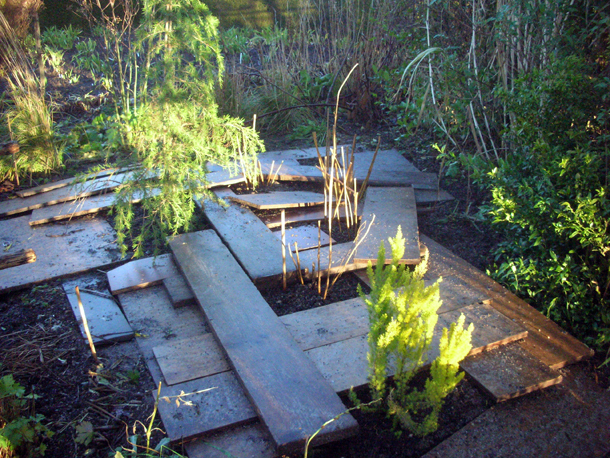 Finished spreading & mixing in mushroom compost on the bed I was working on in the High Garden. 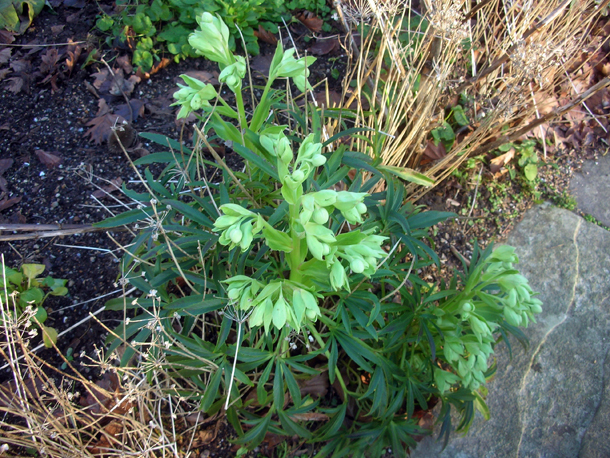 Then we made a start on cutting back the foliage of Hellebores orientalis, this is mainly for aesthetic reasons so that the flowers can be seen and not be covered by the foliage, but this will help them to be pollinated by insects more easily to set good seed for next years plants. Went back to nursery at 3.30pm to close frames and check if anything needed watering as well as attending to my greenhouses. Weather: Wonderfully dry and warm, temperature 10°C throughout the day with hints of sun and even a beautiful sunset in that wintery watery kind of way. I was given my first proper responsibilities today, and am to look after the hothouse that has cuttings and tender perennials for our own gardening stock like Impatiens bicaudata, begonias, and the cool house - a new greenhouse built recently that houses ferns, cacti & succulents. I will be consulting closely with deputy head gardener Siew Lee who has been looking after the hothouse. We did some clearing of dead leaves & taking out dahlias that had formed tubers from cuttings to store in the cellar, and rearranged the plants to help make it easier to look after them, grouping plants with similar needs together. 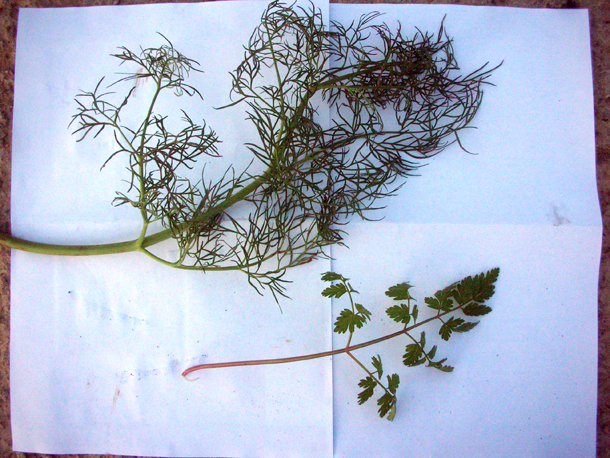 Here I begin familiarising myself more with the plants there and to hone my sensitivity to their needs. One of the keys to successfully looking after greenhouse plants is getting the watering right especially in the hot house. 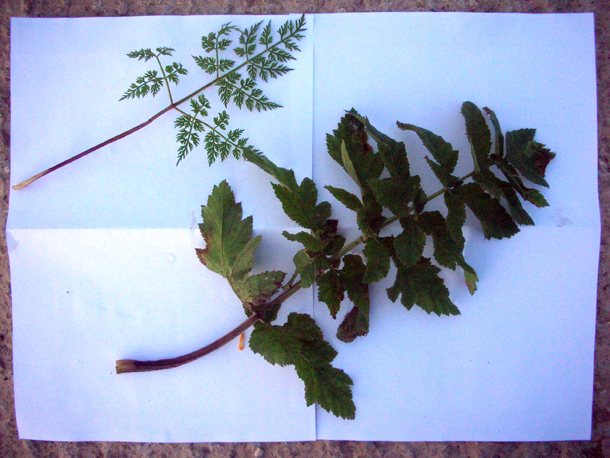 This is easier than it sounds, there are lots of factors to consider - the different needs of different plants, the human factor, the cutting heat bench itself is hotter on one side than the other & is dependent on how the cuttings are done (e.g. a small pot with a lot of cuttings can need more water - it does help you to understand how best to do things throughout the whole process). I carried on with clearing dead leaves, weeding. Split and replanted some Leucanthemum x superbum (aka Shasta daisies), and rearranged or relieved over congested clumps of Mysotis, Anthriscus sylvestris (aka Cow Parsley), Lychnis coronaria etc. Then started to spread mushroom compost thinly over the surface of the whole bed and gently tickle it in. Weather: Mainly overcast with broken sunlight, very light rain from around 12pm that got heavier in the last hour of work. 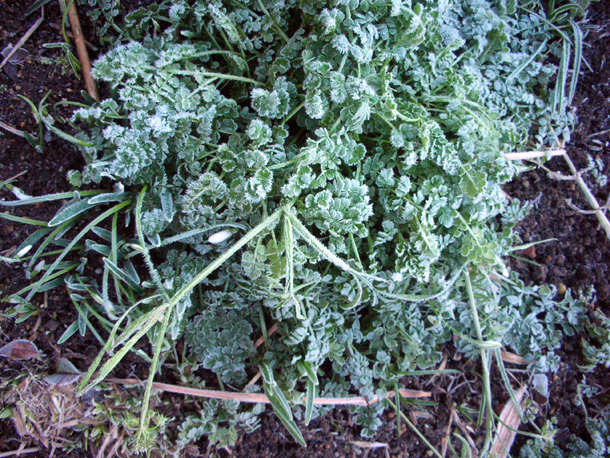 Temperature rose from 4°C to 9°C degrees. Work in the garden has already resumed as normal, but with the blissfulness of it being exceptionally quiet & peaceful and things were still caught up in the sleepy slumber of the Christmas holidays. I love cold winters but nothing beats being out on an uncold January day. I was given a section in the High Garden to work all by myself. 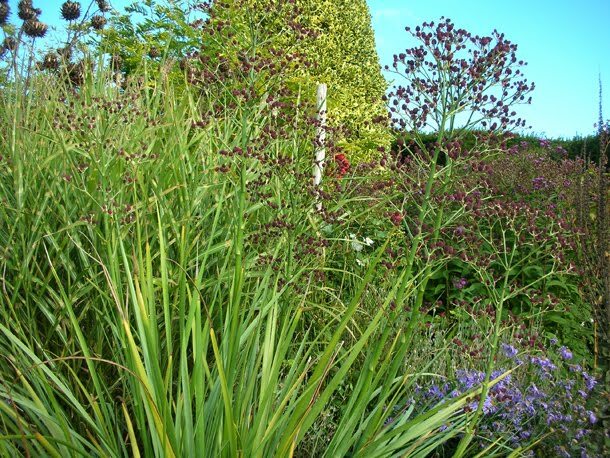 It involved digging out Crocosmia 'Dixter Flame' that had ran into the bush of a Liriope muscari (see photo above), which is a tuberous herbaceous perennial that still has luscious green growth at the moment. 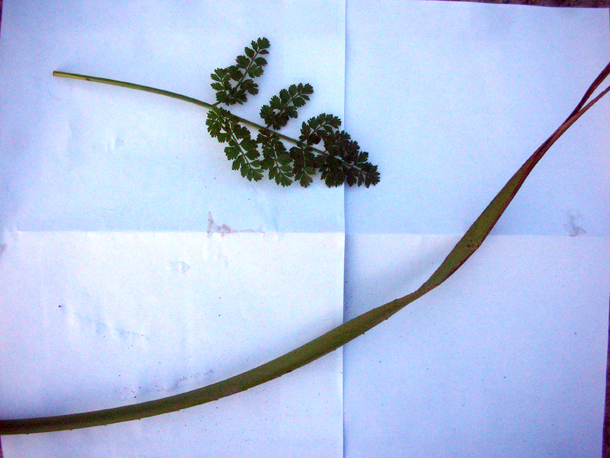 I reduced the crocosmia patch as a whole, as they can spread rampantly. 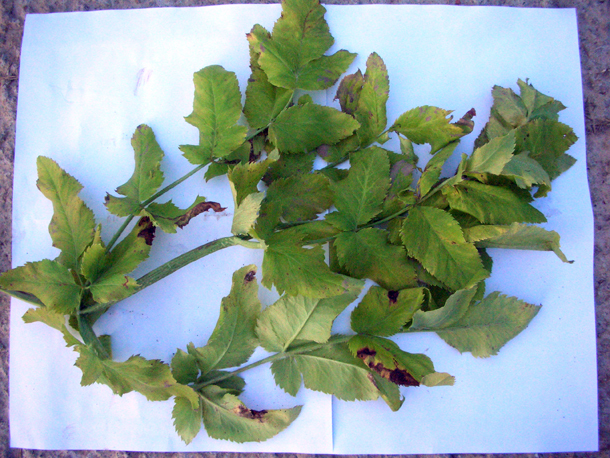 I also cut back the dead foliage of surrounding geraniums including Geranium 'Mavis Simpson' - barely distinguishable apart from faint buds in the soil & the odd remnants of dead stalk with characteristic ridges, which I then marked out with upright canes. Weather: Dark & overcast throughout most of the day. Temperature around 7°C. We planted most of the last bulbs that were still unused in the Peacock Garden along the driveway in one big bed, including the ones that are unknown. So it will be a diverse sea of tulips and narcissi that can be matched with their names and used for cut flowers etc. Dan Pearson and his team came to Dixter to learn how to make ladders. This took place in our wood workshop in the medieval barn and we were around to assist. I was exhilarated to be given the chance to make my own too. 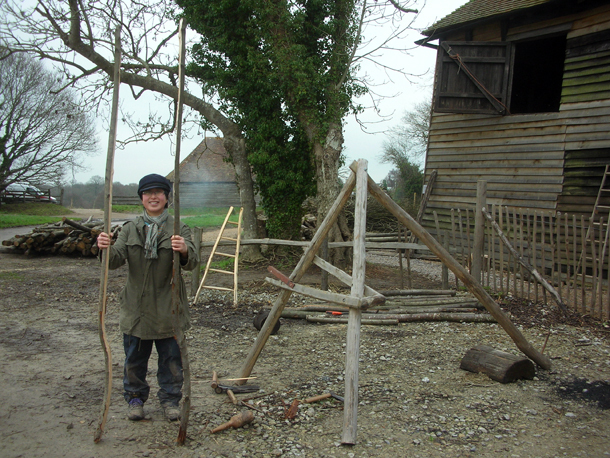 I was over the moon when I successfully split my first length of chestnut wood (from Dixter's own woods). We did this with a froe and a mallet (some were made that day from an arm of a tree), using a frame that was specifically designed to help hold it in place. I loved how it particularly had a curvaceous swerve at the bottom. Then with a draw knife (I had a real preference for the rounded turkish kind), I took off the bark of the tree so that it would not rot and rounded/ finished off any edges and surfaces to how I liked. I was particularly liking the roughly hewn look - the primitive quality that gave no mistake that it was carved out of ones own hands. Then we drilled holes along the length for the rungs, which I carved out of individually chopped pieces of wood. Then we clamped the whole thing together tightly, putting long nails in it for extra security. I enjoyed using a shave horse - which will be my next project! 9 ladders were made, piled on a car roof rack and taken back to London on the train. Weather: Temperature - 6°C going up to around 8°C. A nice, mild, sunny & dry day, the light lasted longer than usual. 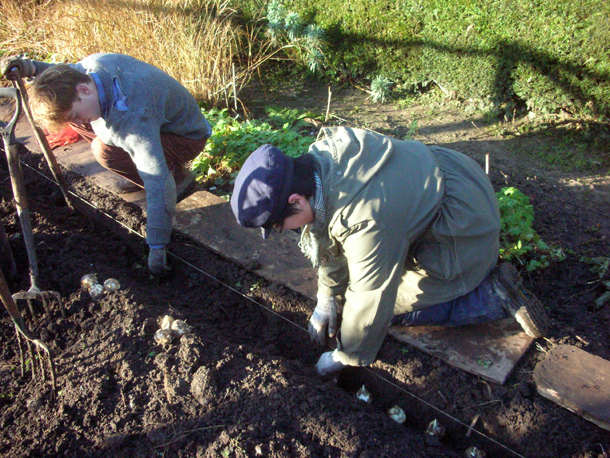 Today we planted rows of camassias and Allium ampeloprasum var ampeloprasum (Elephant Garlic) bulbs as stock near the vegetable garden. Weather: 7°C in the morning. Torrential rain and wind for most of the day from 9am. Thankfully when it rains it's less cold and when it's really cold it's more likely to be dry. 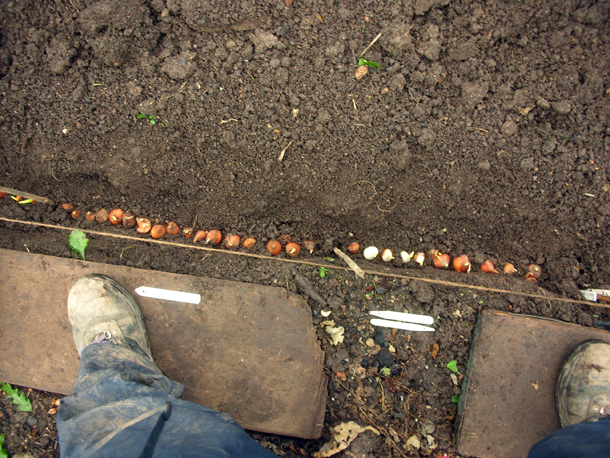 We are still planting the last of our bulbs, we did as much as we could in the High Garden before the rain kicked in and it got too wet to be working on the ground. Big clumps of Aralia californica were lifted as they got a bit lost where it was positioned, and have to decide where better to put it in the landscape. In that place a couple of conifers were planted instead. Fergus wants to give this area more of a zing. 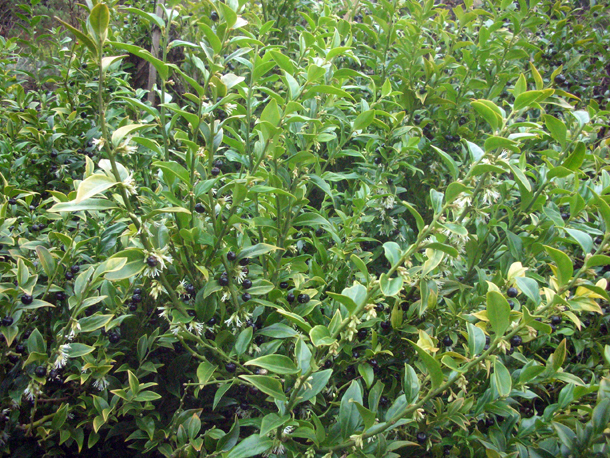 We are hoping that the comfrey there is the - Symphytum ibericum 'All Gold'. I lifted up big clumps of phloxes, disturbing their roots as less as possible, and some of these were planted in that area (about five). 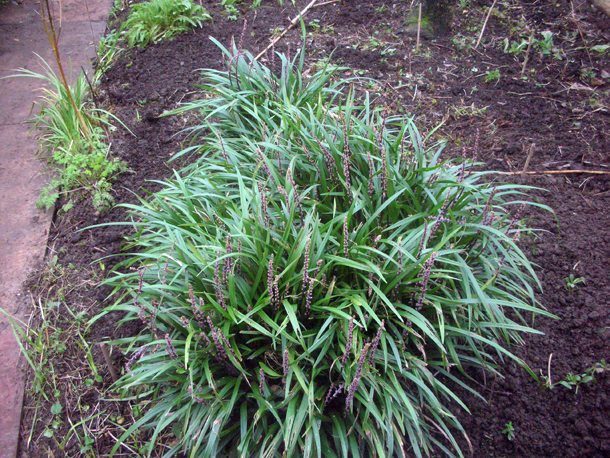 I then split the rest and spread it out in the bed that I dug it out from as extra stock for us and the nursery. Then we resided to the nursery, pricking out some Ferula tingitana 'Cedric Morris' and potted up some Phygelius sp. (the shrub that has flowers that looks like pink balloons wrapped around a tube before if comes out fully). The fennel were still a bit tender and some were still germinating, so we only pricked out some of them (3 out of 5 pots) and put them in Michael's glasshouse which is kept at 8°C, where they can get a lot of light and be more sheltered.